The Independent living area in the Upper Galilee - managed by Noga Sivan and Ofer Michaeli. Access Israel North (A.I.N) - run voluntarily by Dr. Revital Schurtz-Svirsky and Giora Lev. Eilat and the Arava area - run by Rachel Regev. The award was presented in a moving ceremony attended by regional managers who successfully led inspiring projects and activities and also attended by a representative of the “Access Israel” management - Rani Binyamini, founder and treasurer. "The integration award" is intended to recognize integration activities and to draw attention to activists who in their devotion and their dedication to this mission, lend a hand to promote the integration of people with disabilities in Israel, and serve as a model for many people. 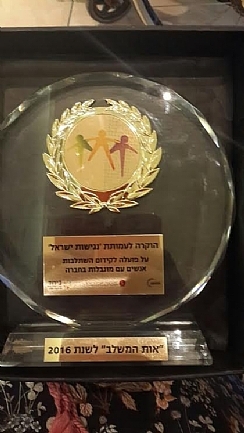 "The integration award" is presented by “Beyachad” to groups and organizations who have significant activities for integration in education, recreation, employment, housing and military/ national service, in whose framework are integrated disabled children, youth or adults together with children youth or adults without disabilities. The award expresses the appreciation and recognition of society to those who contribute and support the integration and fulfillment of the command to love your neighbor as yourself. Picture below: Noga Sivan - Director of Independent Living Area Galilee, Rani Binyamini - the founder and treasurer of the association, Rachel Regev - Director of Eilat and the Arava area, Dr. Revital Schwartz-Svirsky - director of Access Israel North. Heartfelt thanks and congagulations to all regional managers and volunteers - you deserve it.